This post is sponsored by Q Squared. One of the things I love most about Instagram is stumbling across different brands and companies that I may have never encountered otherwise. It’s so fun to see what other influencers are loving, which posts are going viral, and what other Insta-friends are liking and commenting on. Q Squared is one of those brands whose products I absolutely fell in love with as soon as I saw them cross my feed. They make some of the most beautiful tableware that you’d never guess is made out of melamine and completely shatter-proof. So naturally, when they offered to send me a set of my choosing, I jumped at the opportunity. After all, Memorial Day weekend is upon us which means outdoor-friendly, shatter-proof dinnerware is where it’s at! You can see from the photos just how beautiful these products are (and this is just one of the designs to choose from!) but what you can’t see is just how amazingly durable they are. They truly feel like legitimate dinnerware and you do not have to worry one bit about it looking cheesy or cheap. High class all the way! As soon as I decided on the Lima design as my set of choice, I started brainstorming what eventually turned into this Spring Fava Bean and Burrata Grain Salad. I knew I wanted to take advantage of all of the bright blues and greens in the dinnerware and all of the in-season spring produce, so I took a little trip to the Farmer’s Market for inspiration. What I came across were the cutest little spring onions and piles upon piles of fresh fava beans. Not to mention fresh basil! 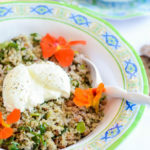 I decided that these spring superstars, with the addition of quinoa, toasted walnuts, fresh lemon juice and creamy burrata, would make the perfect grain salad to serve over Memorial Day weekend. Which brings me to the other topic of this post: My Top Four Outdoor Entertaining Tips! 1. Opt for sturdy tableware. 2. Plan your menu around what’s in season in your area. For me, outdoor entertaining is THE time to showcase the season’s best produce. We’re dining in nature, after all, so why not enjoy what nature has to offer? 3. Serve food that is okay being left out for a bit. Outdoor cookouts are typically meant to be casual get-togethers, not multi-course plated dinners hot out of the oven. You’ll want dishes that can sit out for a bit for people to help themselves at their convenience. Be sure to offer something that people of all dietary preferences can enjoy. This is one of the reasons I love grain salads. 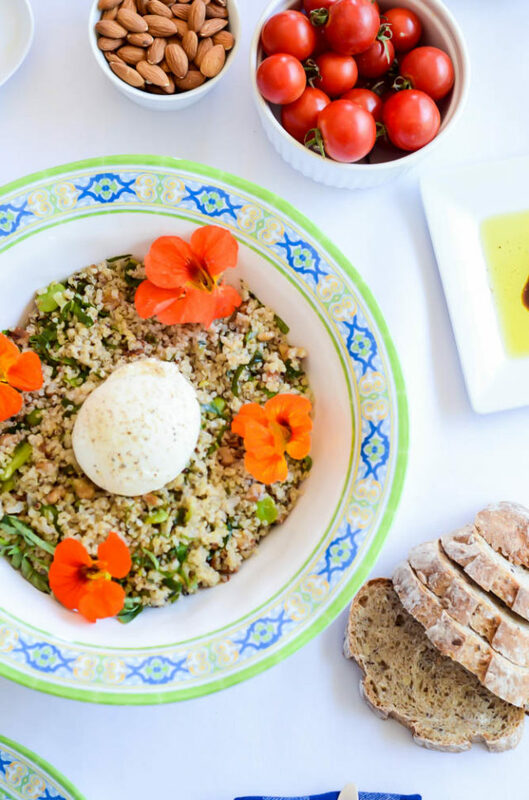 Although it’s not vegan due to the cheese, this Spring Fava Bean and Burrata Grain Salad can easily be made so by just omitting that part. Be sure to offer something vegetarian, vegan and omnivore-friendly so no one leaves hungry. Not too difficult, right? Like I mentioned, one of the greatest things about outdoor entertaining is that it’s meant to be CASUAL. Low-key, easy-going vibes are where it’s at. And with the right food and serving ware, can you really go wrong? Now comes the best part. I’ve teamed up with Q Squared to offer you, my dear readers, a 20% discount on all of their products. So time to stock up! Just be sure to use the discount code CALIGIRL20 at checkout to get this sweet deal. Recipe is below and link to buy all the pretty things is here. What are you waiting for?? 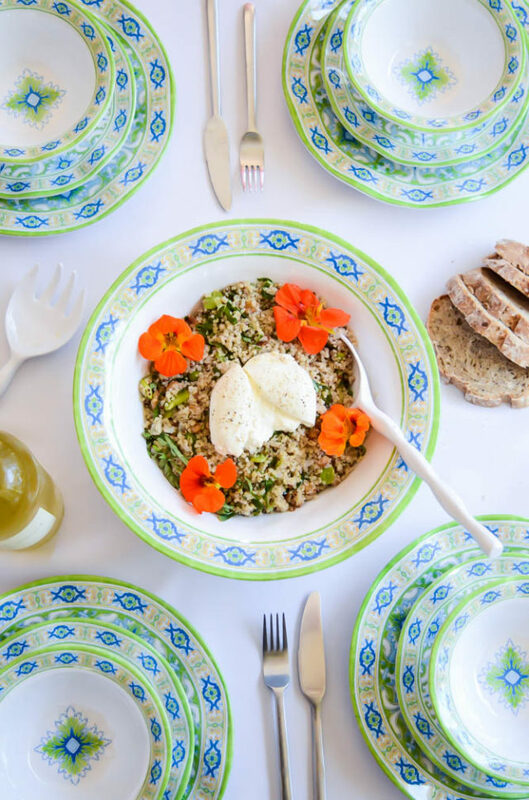 This grain salad is the perfect outdoor entertaining dish. 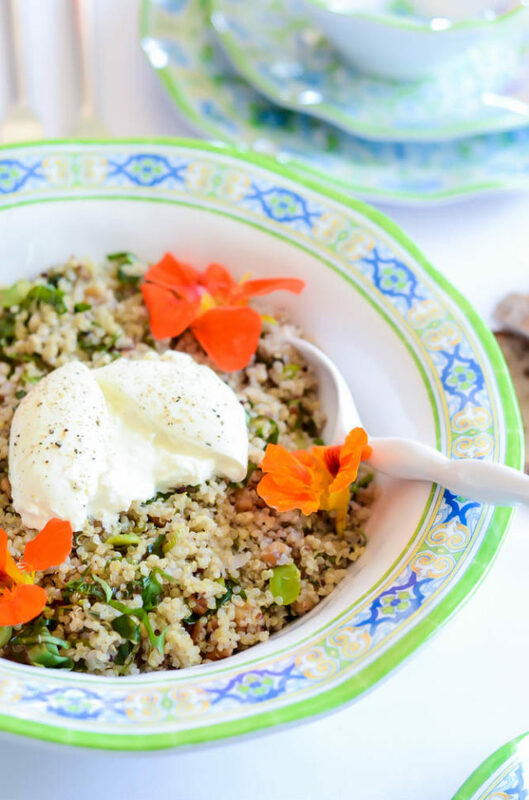 It's loaded with filling quinoa and fresh vegetables and topped with creamy burrata cheese! First, prepare the fava beans. You’ll need to pull the beans out of their shells, and then cook the beans in a small pot of boiling water for 30 seconds, transferring them to an ice bath afterwards to cool. At this point, you should be able to peel off the beans’ waxy coating. In a small saute pan, melt the butter over medium heat. Add the shelled fava beans and season with ½ teaspoon salt and ¼ teaspoon pepper. Saute for 5-7 minutes, then remove from heat. 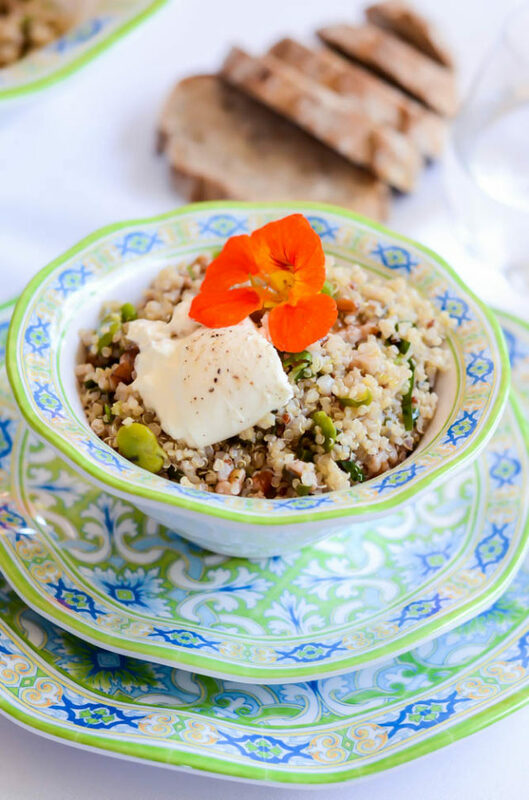 In a large bowl, combine the quinoa, fava beans, spring onion, walnuts and 1/3 cup basil. Dress with olive oil and lemon juice and toss to combine. Season with more salt and pepper as needed. If not serving right away, refrigerate for the time being. Right before serving, top with burrata. Cut into it (breaking it into smaller pieces) so each person gets a piece as you’re serving. This looks SO so good, Robin! Thanks, Cynthia! It’s so refreshing and tasty!